Wedding dress outfit consisting of an embroidered silk satin dress and tulle veil. Worn by Margaret Whigham, later the Duchess of Argyll, for her marriage to Mr Charles Sweeny in the Brompton Oratory, 21 February 1933. The dress took a team of 30 seamstresses six weeks to make, and the bride thought it shockingly expensive at £52. 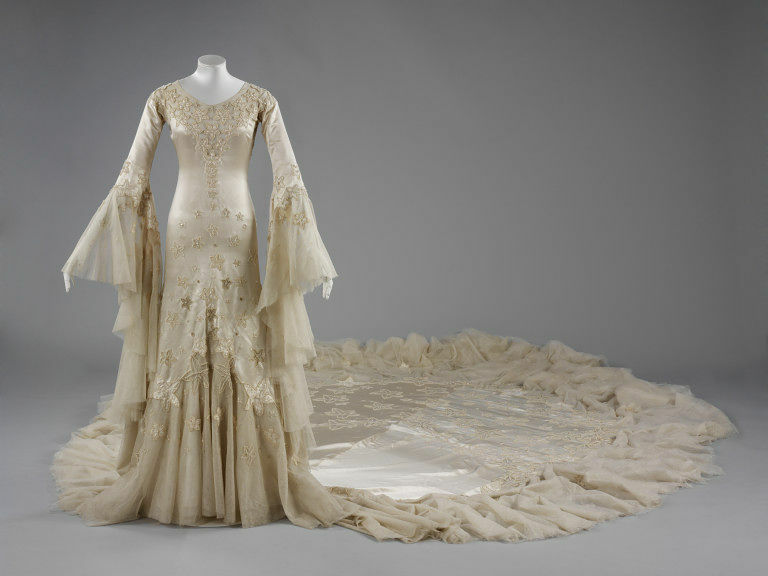 The veil (T.306-1978) was donated a few years later, in 1978, and is catalogued with the dress (T.836-1974). Margaret Whigham was the only child of Helen Mann Hannay and George Hay Whigham, a Scottish millionaire who was chairman of the Celanese Corporation of England, North America, and Canada. After being educated privately in New York City, where she moved one week after her birth and lived until the age of 14, and making her debut in London in 1930, she announced her engagement to Charles Guy Fulke Greville, 7th Earl of Warwick. This wedding did not take place as she had fallen for Charles Sweeny, an American amateur golfer, and decided she was not sufficiently in love with Lord Warwick. Margaret and Charles Sweeny divorced in 1947, and in 1951, she became the notorious Duchess of Argyll, third wife of the 11th Duke of Argyll. British Pathe filmed society beauty Margaret Whigham and her husband Charles Sweeny as they emerged from London's Brompton Oratory. The film shows crowds of women jostling with photographers to catch a glimpse of the bride and her magnificent Hartnell wedding gown. Her dress, which incorporates a nine-foot train, is an early example of a wedding dress designed for the day.